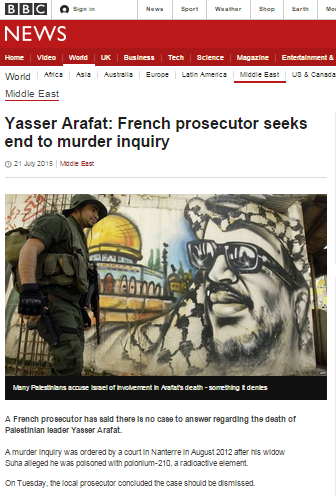 “A French prosecutor has said there is no case to answer regarding the death of Palestinian leader Yasser Arafat. A murder inquiry was ordered by a court in Nanterre in August 2012 after his widow Suha alleged he was poisoned with polonium-210, a radioactive element. The French findings echoed those of the Russian Federal Medical and Biological Agency, which said in December 2013 that Arafat “died not from the effects of radiation but of natural causes”. Notably, the BBC News website refrained from reporting on the results of the French investigation at the time of their official publication although it did cover an earlier leak in two reports. Its coverage of the Russian results amounted to one article. However, coverage of the Swiss results saw BBC News website users bombarded with no fewer than thirteen reports on the topic in the space of 48 hours. A recurrent feature appearing in most of those reports, as well as in additional BBC content, was the amplification of conspiracy theories surrounding the then 75 year-old Arafat’s death. Remarkably, even in this latest story about a French prosecutor having concluded that there is no point in pursuing the inquiry any further, the BBC promotes that same conspiracy theory no fewer than three times. “Many Palestinians accuse Israel of involvement in Arafat’s death – something it denies”. Just a day before this article was published the British prime minister gave a landmark speech on extremism in which he repeatedly noted the connection between conspiracy theories and radicalization and extremism. There are few, if any, publicly funded bodies as influential and far-reaching as the BBC. Its content reaches nearly every British household and hundreds of millions more around the world. The information it produces is used by policy-shapers, decision-makers, academics and educators and passed on to the next generation because it is considered to come from a respectable, reliable source. So when the BBC repeatedly and knowingly amplifies baseless conspiracy theories, they are legitimized and mainstreamed into public consciousness and – to borrow a phrase from Mr Cameron – the BBC too becomes part of the problem which British society is so urgently trying to address. The point about conspiracy theories is extremely important and remarkably timely. PLEASE – bring this to the attention of David Cameron, copying in John Whittingdale. He sufered from SLIM, an early form of AIDS, common in East Africa, where he used to visit as a “head of state”, 1977 was filmed by Roamiam/KGB team screwing in a government hotel, a government supplied male prostitute, General Ion pacepa reported about it in a book, 1988, he writes at PJMedia. Arafat was an Egyptian fruit-cake, had an entourage of young boys where ever he went,”refugees-victims”! One of my buddies sat at a table in Tunis with 20 of them while Arafat the Dororthy was ladling the soup!